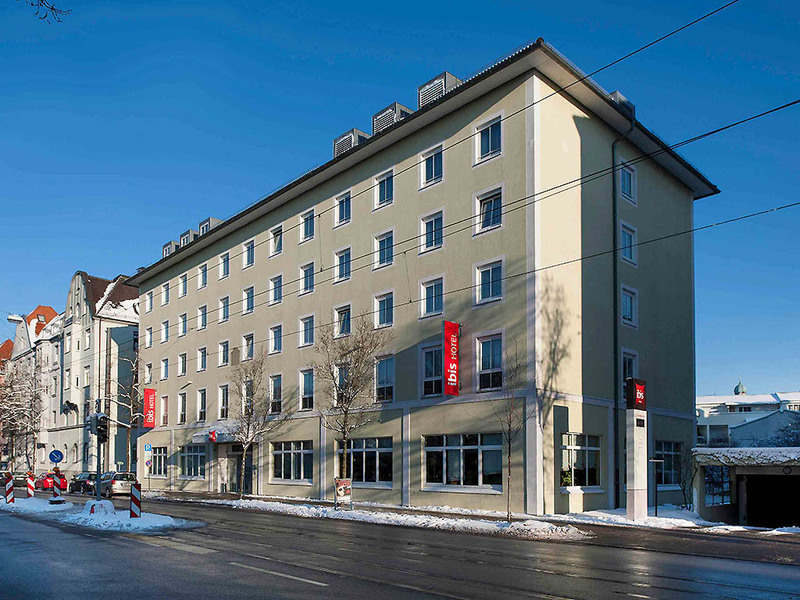 Hotel ibis Augsburg Koenigsplatz. Book online now! Located in the heart of Augsburg, the ibis Augsburg Königsplatz hotel is the ideal starting point for sightseeing tours. The hotel's location close to Annastrasse and its many stores makes shopping a real pleasure. Close to the main station. (10 min. walk) I asked for a quiet room and I get it. The room was very clean, so was the bathroom. Very good breakfast. A plus for the PC with printer in the lobby that help a lot. Very helpful and pleasant Staff, good rooms with everything a I need. I got a very nice and quite room and the staff fulfilled everything I asked for. Breakfast was very varied and tasty, checkin and checkout were smooth. There is nothing I could complain about. Thank you for the very nice stay! Very helpful reception and bar staff. Room was ready and clean and comfortable. Had a good nights sleep. Hotel within easy walking distance of old town and restaurants. Stayed there several times before and will always go to that hotel again when staying in Augsburg. It wasn't my first stay at this hotel, but what I always miss is the poor variety of TV channels, especially international stations like CNN, BBC, France24, AlJazeera etc. I frequently stay at Ibis all over Europe and broad TV access is a very important feature for me that will certainly decide over my choice for future stays. Standard Ibis, not far away from the city center, it has a good parking lot (10 euros/day), I did everything walking, good reception, room was nice, shower had real walls, so it is ok to share the room with a friend. Nice Hotel, good staff, room is good, ibis style! We stayed here on a family short break to Bavaria. The rooms are basic, but they do have everything you need. The rooms were very clean (spotless to be honest), the beds were very comfortable and the shower was very good. The location is a short walk from the station and the town. The rooms are very quiet and we all had a great sleep. In the evening after returning from town we enjoyed sitting in the bar area for a drink before going to bed. The lady at the bar was very friendly and the beer was very good. Location, and all service was great!The dinner and Brakfast we did at hotel, relation between quality and price was perfect Rooms are clean and perfect space for a short trip, I recomend! The chsin. Simple and perfect we know what to expect! Staff were cheerful, polite and helpful. Our room was spotless, bed comfortable and it was very quiet. Location perfect near the train station and walking distance to the town. Will definitely go back again. The cost of breakfast was too expensive, 11euros per person, parking was 10euros per night and difficult to find any spaces. No free wi-fi in the rooms and the connection in the lobby was very poor and slow, also the temperature in the bedroom was too hot with no means of lowering apart from opening a window which was not sensible as the outside temperature was below freezing most nights. A decent hotel, at a reasonable price. Online check-in was quick and easy. The staff were friendly and helpful. More than suitable for a short stay in Augsburg, so much so that I'm staying again in November. Nice hotel in quiet area of Augsburg. We got three bed room in the top floor with really good price so this good basic hotel felt like a luxury. City of Augsburg was also worth of visiting. Only short ride to Legoland Gunsburg with train. I've booked a DBL room in this hotel via a LeClub Accor special offer: 2 nights and free breakfast+wi-fi+1 extra person (kid) free. Location is excellent for exploring the centre - just a 5 minutes walk to the Old City. Covered garage costs 10 EUR per day but you can leave your car just opposite the hotel for free. Breakfast features a variety of food and drinks. The staff was very efficient and polite. And you can get to Legoland within just half an hour drive from the Hotel! In fact I've been staying in this hotel several times because of kind front desk attendants to take care of everything in your stay. The bar is also great! A big cup of peanuts keep the good taste German beer better flavor. Just wonderful! The location is also very good. Go out and make a right to the popular TRAM station where you can find restaurants, food, supermarket just in a 3-5 minutes walking distance. Go through the TRAM station is the downtown center to enjoy the landscape of old historic buildings and see how the modern teenages playing in this old-fashioned city. If you make a left at the TRAM station and go straight, you'll find Augsburg main station in 5 minutes by walking. The breakfast is very good. A lot of vegetables, cheeses and breads for selections. I like their German cucumber, taste sweet and fruitful. Coffee is good. You can get it from a coffee maker with instant grinded coffee beans. I love this hotel. Only the sleeping quality is a little bit to be improved. Some noises on my room from upper floor. The hotel was in mantainance and we we were not informed about that before. The air condionated was not working and nothing was informed before, only when we asked for it. There was no carpet in the shower. The smell of glue was all over the place. Disgusting.